It’s the end of March, the sky is gray, and I’m dreaming of color. I do believe it’s time to begin propagating flowers for the upcoming seasons! Annuals and perennials in all shapes, colors, and sizes are important for biodiversity in the garden. They attract bees, butterflies, birds, and a plethora of vital insects to your cultivated habitat. 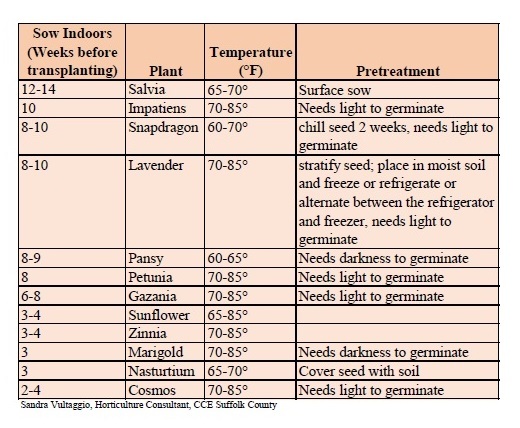 Here in Suffolk County, our average last freeze date is April 20, the rough date to guide you on sowing seeds indoors. Although this isn’t a hard and fast date, keep an eye on the forecast and consider your personal experience in your own yard to decide when it’s safe to set plants outdoors. 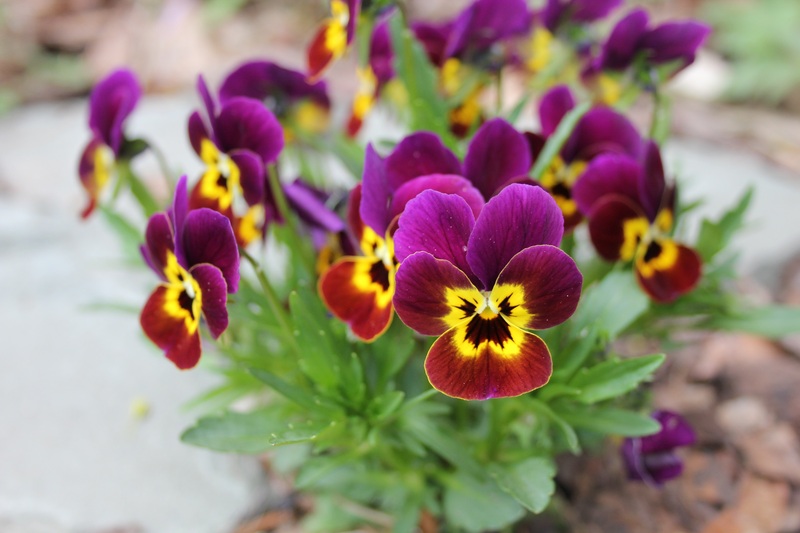 Violas or pansies are blooming outdoors now! Photo © Sandra Vultaggio. Different flower seeds require different germination strategies. Some seeds need light to germinate, others need darkness. Some need pre-treatments like scarification (nicking the seed coat), soaking, or chilling before you plant them. Some flower seeds are much slower to germinate and grow than others; a calendar will help you organize when to plant them. Common flowers that need a longer head start (eight-to-ten weeks before transplanting) include salvia, snapdragon, impatiens, pansies, petunias, lavender, and gazania. Compare those to flowers that need only a few weeks (three or less) such as cosmos, sunflowers, marigolds, nasturtium, and zinnias. Some annual and perennial plants don’t like to be started indoors and then transplanted. Poppies, butterfly weed, and candytuft prefer to be sown directly outdoors. Once you’ve decided what you’re going to grow, research the preferred methods of sowing and pretreatments by browsing books in the library, researching specific plants online, or referring back to the seed packet or grower’s website/catalog. The most important tools for starting seeds indoors are light and heat. As a child, I remember growing seeds inside every spring. I would pick out seed packets with pretty flowers on the cover, and my mom would buy a bag of potting soil and containers or maybe expanding peat pots. We’d sow the seeds, set them on a sunny windowsill, and wait for them to germinate and grow. While starting seeds like this is a great activity for children, usually the seedlings don’t amount to much. A windowsill is likely too cool and too dark for most plants. If you are serious about starting quality plants indoors, you’ll want to invest in fluorescent lights and a heating mat, available at home improvement stores and garden centers. For the really committed, I’d recommend an automatic timer for lights, a propagation stand, and easy access to water. This type of seed-starting setup creates a healthy and controlled environment where your plants can thrive. This entry was posted in Flower gardening, Long Island gardening and tagged bees, flourescent growing lights, flowering plants, freeze date, gardening for birds, growing flowers, growing seedlings indoors, heating mat, insect habitat, propagating flowers, seed germination, seed scarification, Seed starting, sowing seeds indoors, weeks before transplanting on March 31, 2016 by Robin Simmen.